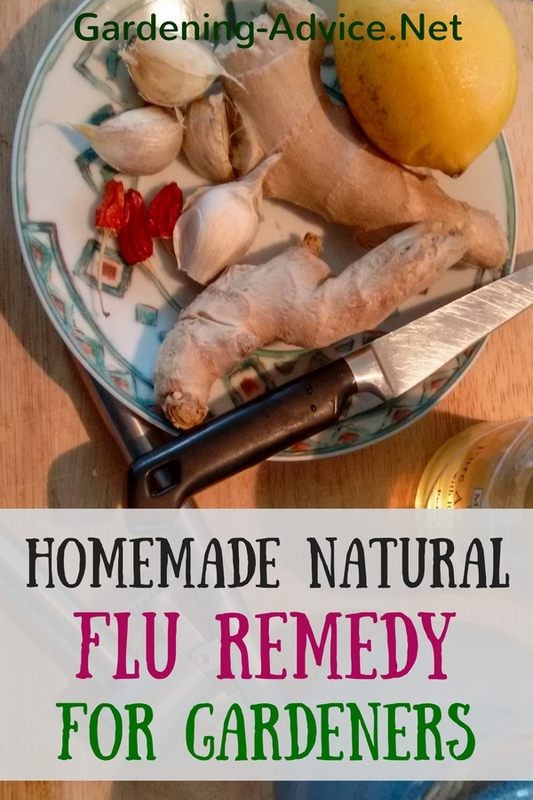 Make your own homemade natural flu remedy from ginger, garlic, chilies and honey. Winter is, unfortunately, the time when lots of us get struck by cold and flu viruses that make us feel miserable. Working hard in the garden one day breaking into a sweat, then a cold breeze and there you have it. The next day the sniffles start, the throat in tingling and the head is throbbing. 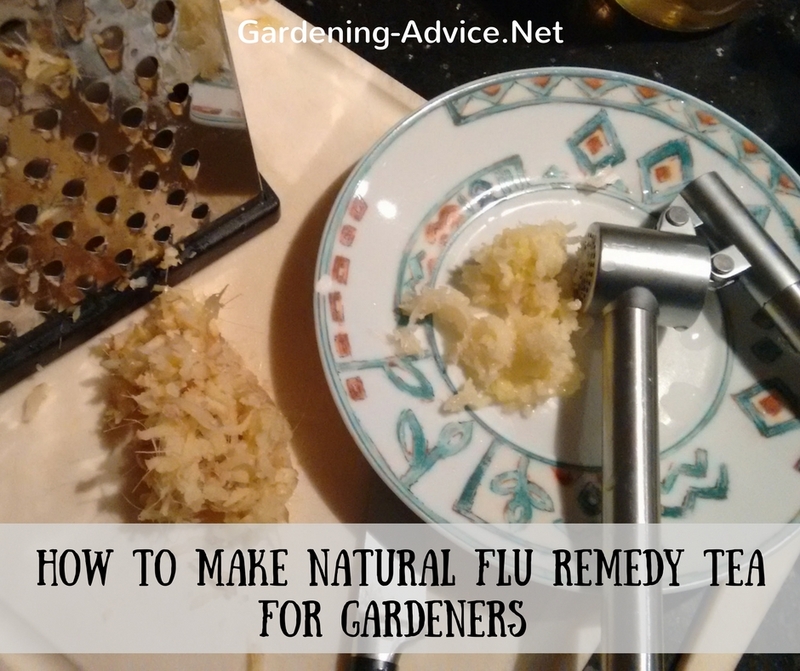 When I feel those first signs of a virus hitting I refer to my natural flu remedy right away! If you take this tea in time the virus often doesn't get a chance to fully break out. 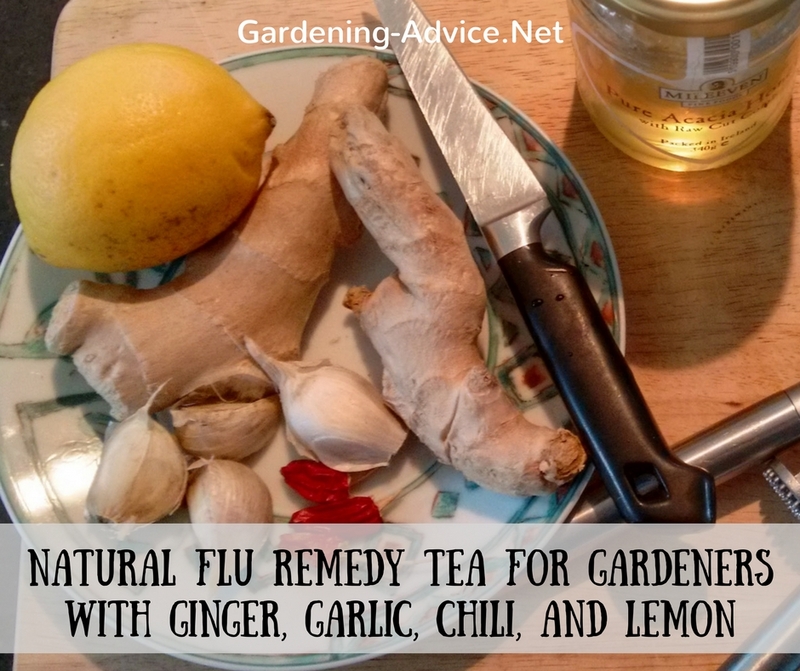 This remedy is full of natural ingredients that have been used for centuries to combat infections: ginger, garlic, chilies, lemon, and honey. And no...it doesn't taste bad at all!! Ginger: contains a substance called Gingerol which works as an anti-inflammatory and antioxidant. 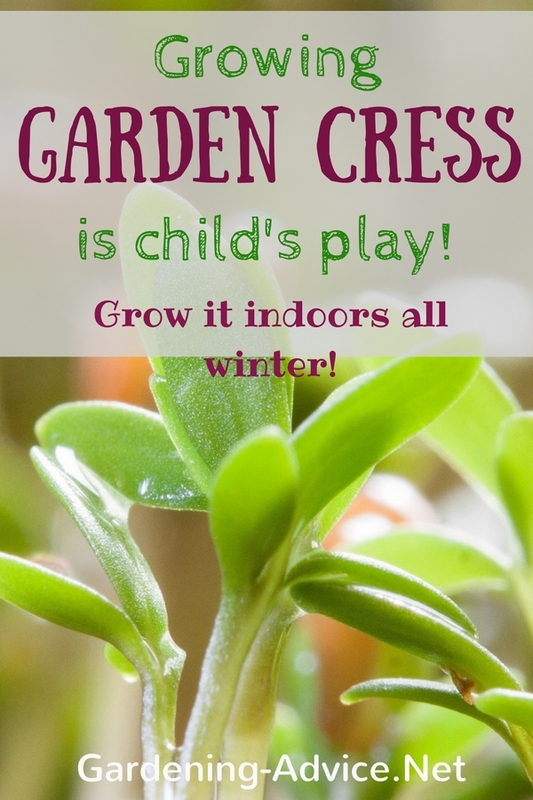 It is also antibacterial and antiviral. 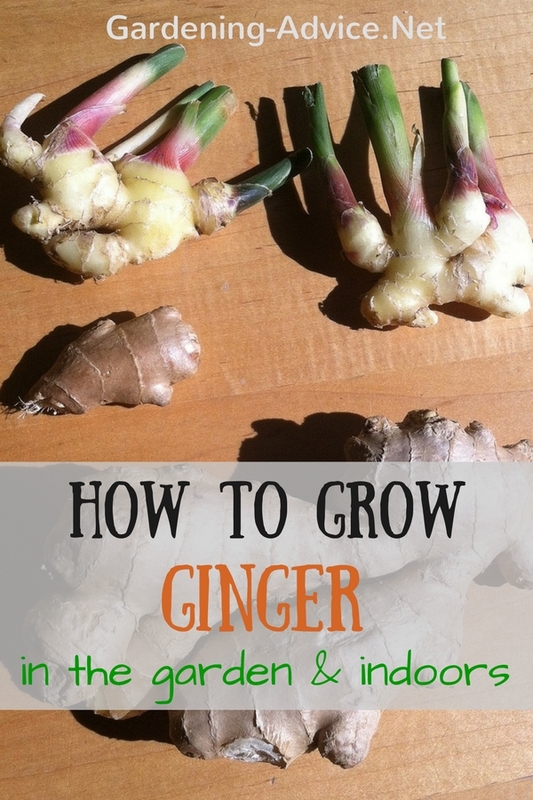 For a brief overview of the health benefits of ginger check here. Garlic: contains allicin which helps to boost the immune system, is antimicrobial and helps to prevent colds. 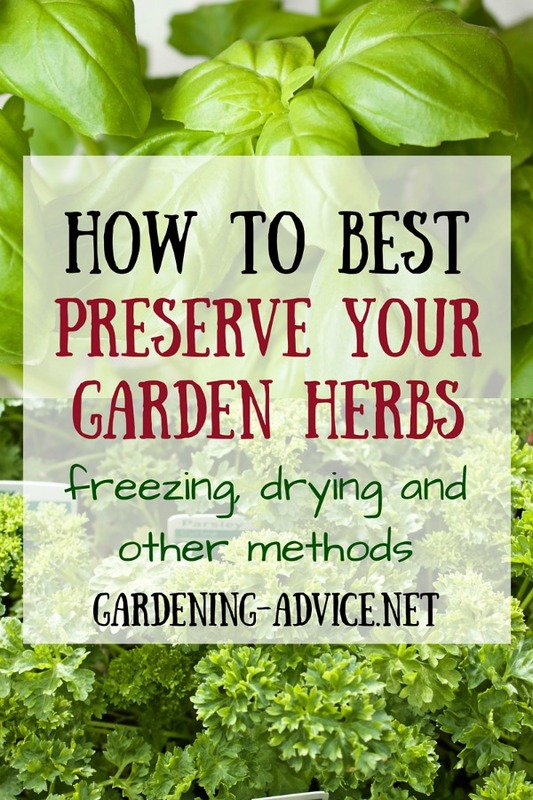 The get the maximum benefit of garlic you have to prepare it the right way. Peel and crush the garlic clove 10-15 minutes before using it. 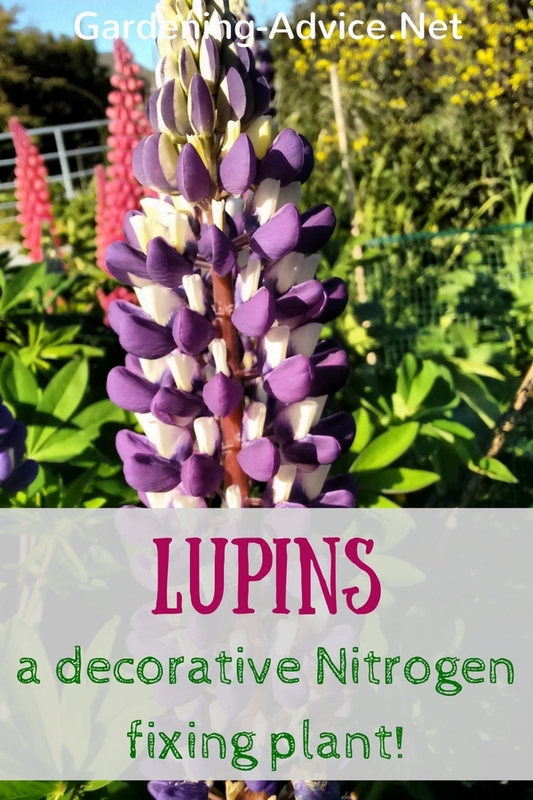 This activates the allicin through oxidization and makes it much more potent. Lemon: Lemon juice helps with respiratory and breathing problems and it is antibacterial. The Vitamin C content and other antioxidants help to boost the immune system. Chilies: The capsaicin in chilies works as an antibacterial. It also helps against congestion and a stuffed up nose. Honey: helps to suppress coughing and it is also antibacterial. Choose a good quality, preferably raw untreated honey for the full benefits. Crush the garlic and let it sit for 10-15 minutes. Don't skip this important step. This makes the tea much more potent. Put the ginger, garlic, and chili pepper in a teapot and pour boiled water over it. Cover it and let it sit for at least 10 minutes. Then add the lemon juice, rind, and honey. Strain into a cup and enjoy! Drink several cups of your homemade flu remedy throughout the day. Disclaimer: The information contained in this article is not intended nor implied to be a substitute for professional medical advice, it is provided for educational purposes only. You assume full responsibility for how you choose to use this information.